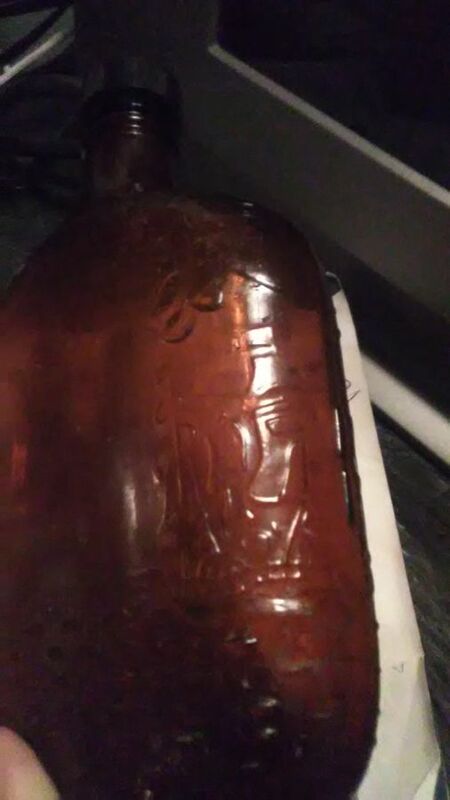 My friend dug up this bottle yesterday. 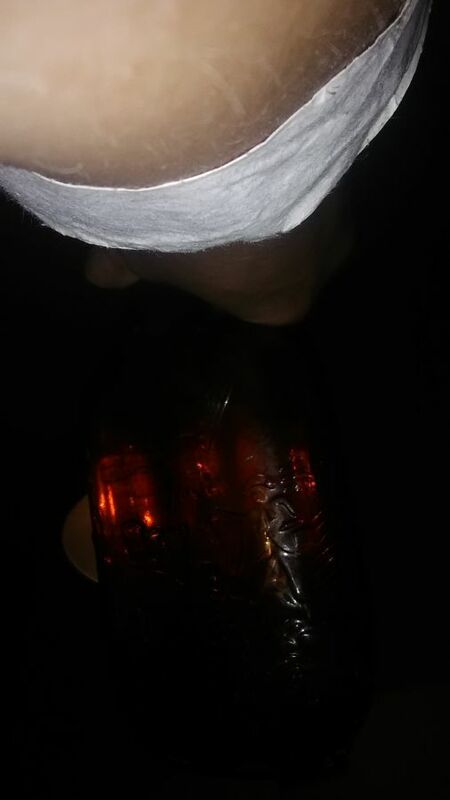 It appears to be a liquor bottle. It looks like it has spaces for labels on the front and back. It has a screw top. 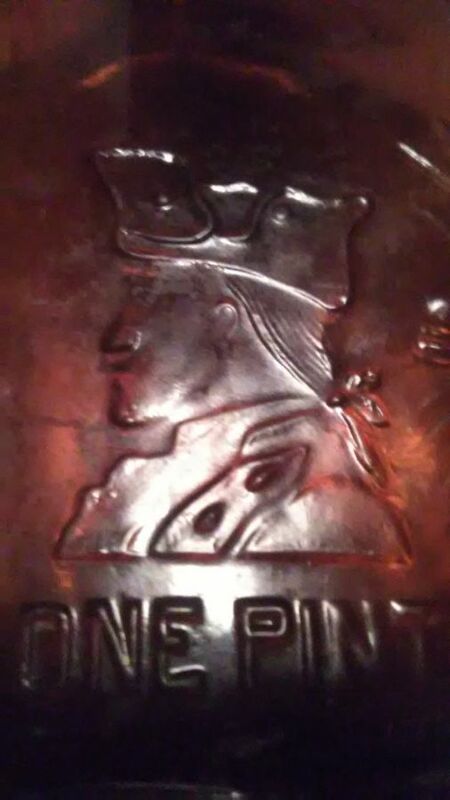 The front reads "one pint" at the bottom w/ a "3" under it, and there is a profile of a revolutinary soldier. The sides show ships and a revolutionary soldier raising a sword. 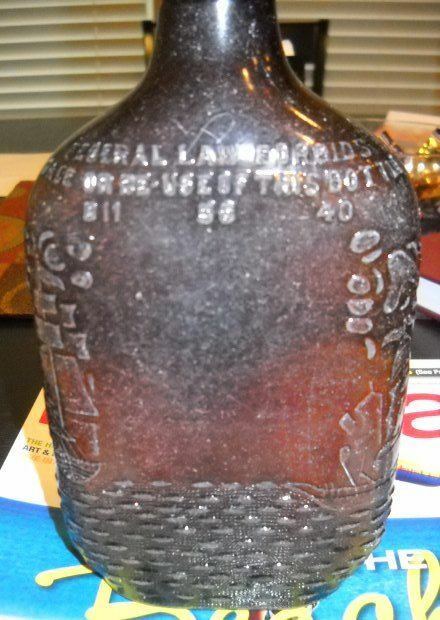 The back reads "Federal law forbids sale or re-use of this bottle", D11 56 40. 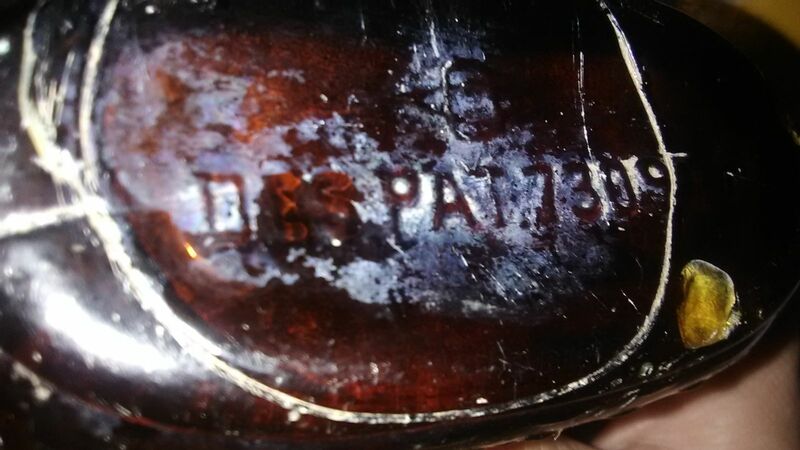 And the bottom reads "Des.Pat.73096" with a 3 under it. What was this? And about how old is it? Thanks. I think I got some of my own answers. 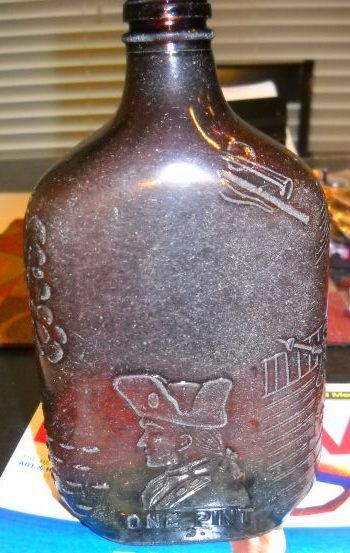 It is a John Paul Jones Whiskey bottle. Very likely the 40 is the year of manufacture. Thanks, Gary. Yes, I have correlated (based on labeled examples) that D-11 marking with Frankfort Distilleries in Baltimore, MD which produced (probably among other items) Paul Jones Whiskey. 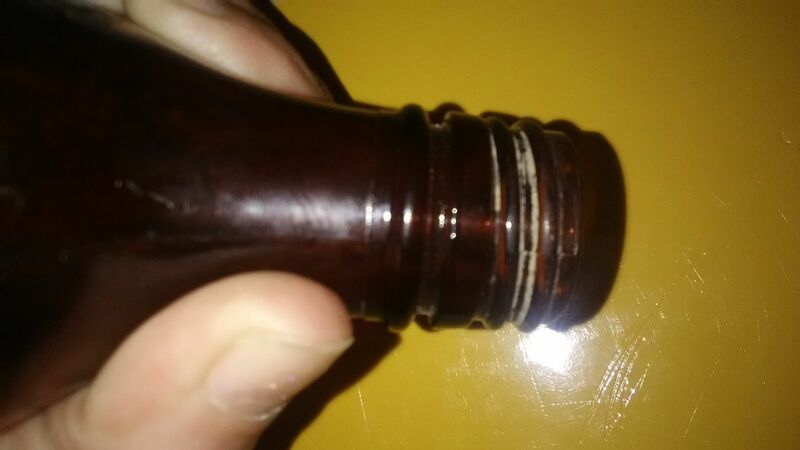 chris, I have a bottle with similar markings but the neck has another step in it and the "federal law forbids..." comment isn't on it and it is not a screw top. 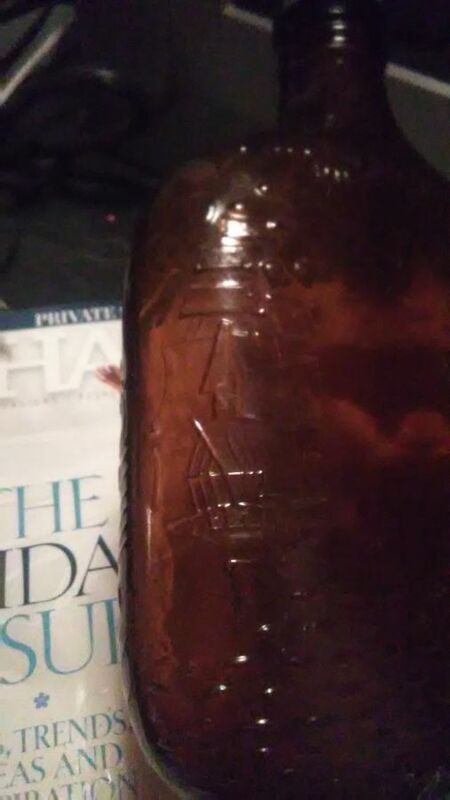 on the bottom is the number 6 then a symbol that looks like two ovals in a cross pattern then the number 4 and underneath the symbol is the number 11. any idea of the age? unfortunately this site wouldn't let me upload my camera photo because it is too big and I don't know how to make it smaller and my camera phone isn't cooperating with my email right now. I see no new post on this. 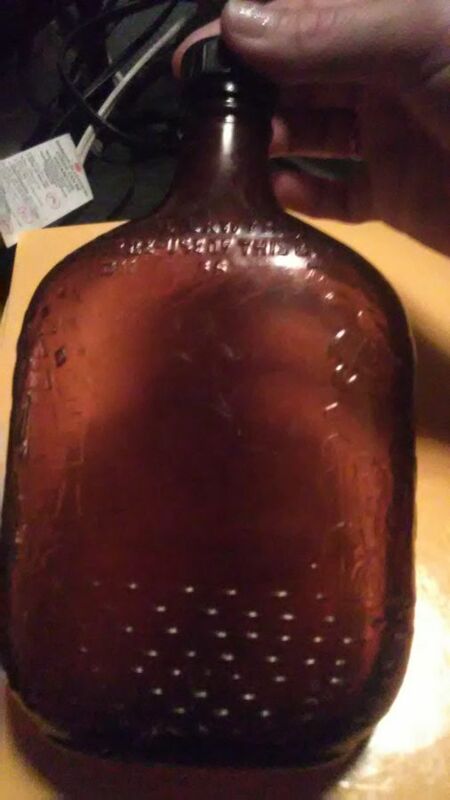 I just found a bottle just like the one garyc has or had. 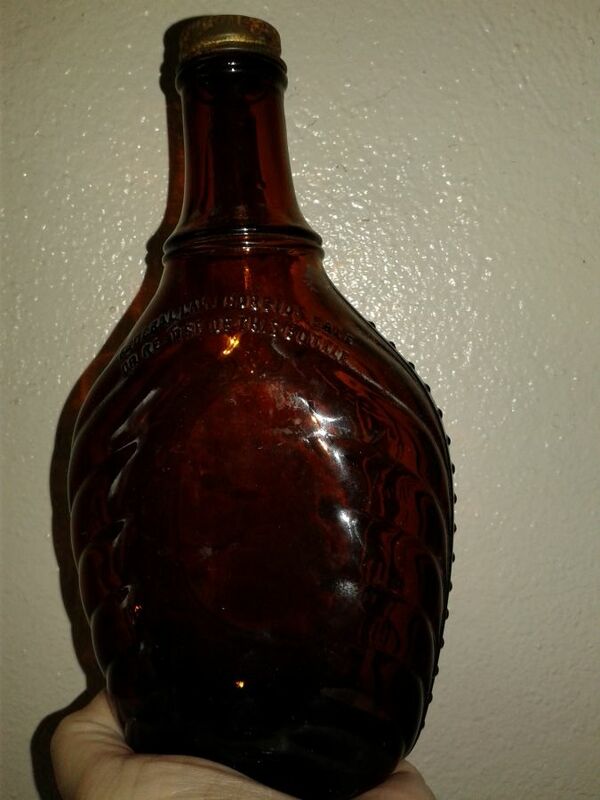 Any extra info on these bottles? Are they worth more than a couple of $ ? 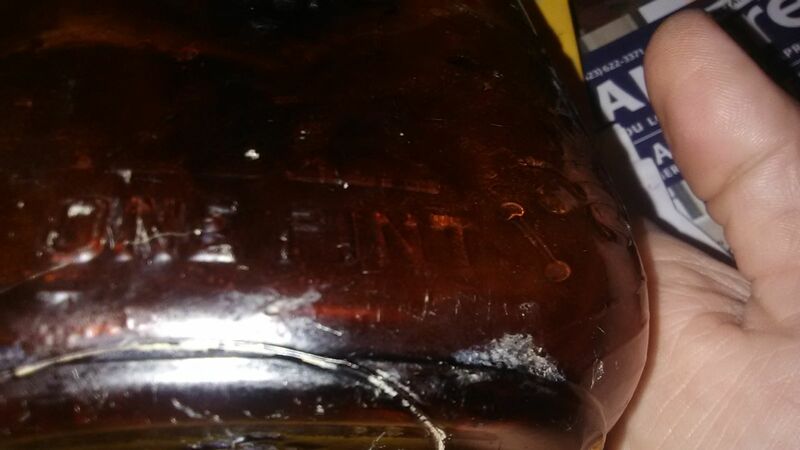 One can say in general that the 20th century whiskey bottles marked FEDERAL LAW FORBIDS... are common and not really worth much unless they retain their original labels, packaging, tax stamp and/or contents. 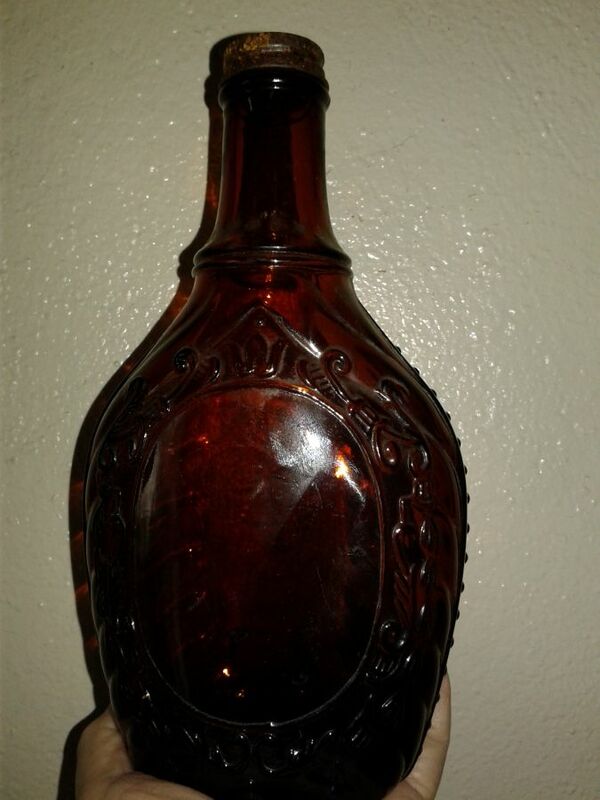 Do you know any info on this bottle? I cannot find anything on the marking D - 90 and 12 49 with a A in a circle between 12 and the 49. 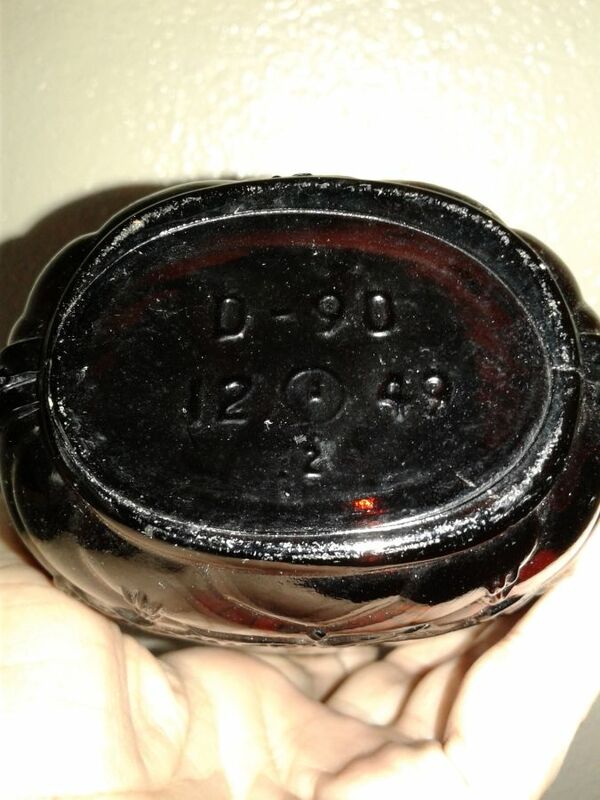 It is from Armstrong cork company I believe that marking a in the circle is for and it has Federal law forbids sale or reuse. 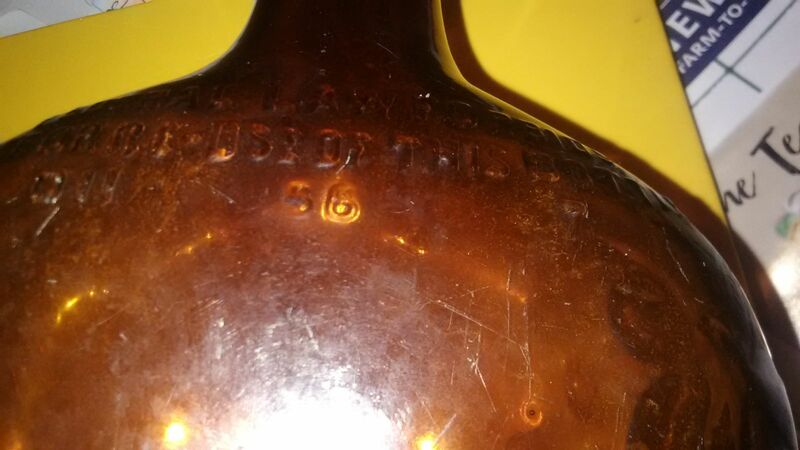 I have a brown whiskey bottle, possibly John Paul Jones from Frankfort Distillery in Baltimore, MD, as I read and discovered in some of your comments, similar to garyc who first posted this bottle, except the numbers under the "FEDERAL LAW" statement read "D11" "56" "7" (Does this mean it could have been made in 1907?) and"2" rather than "3" under "ONE PINT." Could the 2 and 3 possibly stand for 2 piece mold (BIM: Blown in mold, applied lip, dated 1850-1900) and 3 piece mold (3PM: Dated 1820-1880)? Does anyone know? 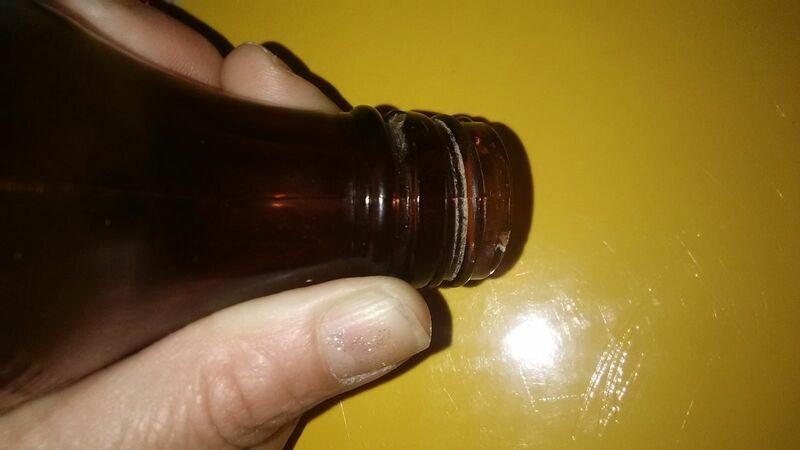 The bottom has a big circle as if it were removed from a punty rod...my fingernail fits in it. However, the circle does feel smooth, so I assume that it was an Iron Pontil that made it, after the 1850s? 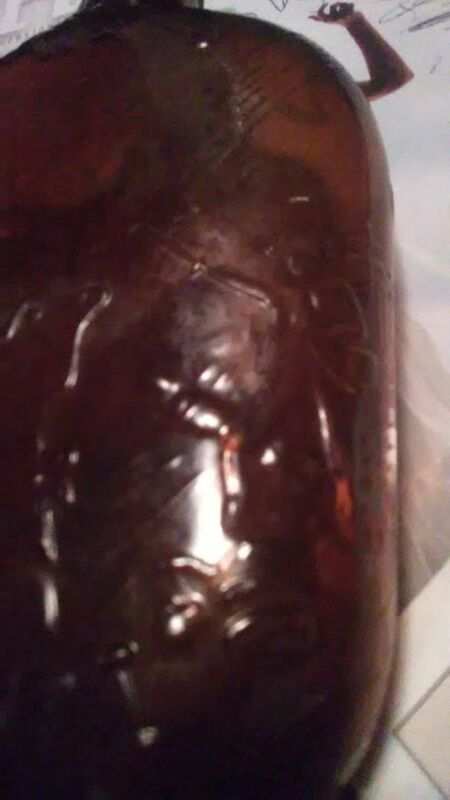 I am not positive how SMOOTH this smooth should be to be considered so...I read that rough circles on bottom mean they were blown in mold, hand-made. 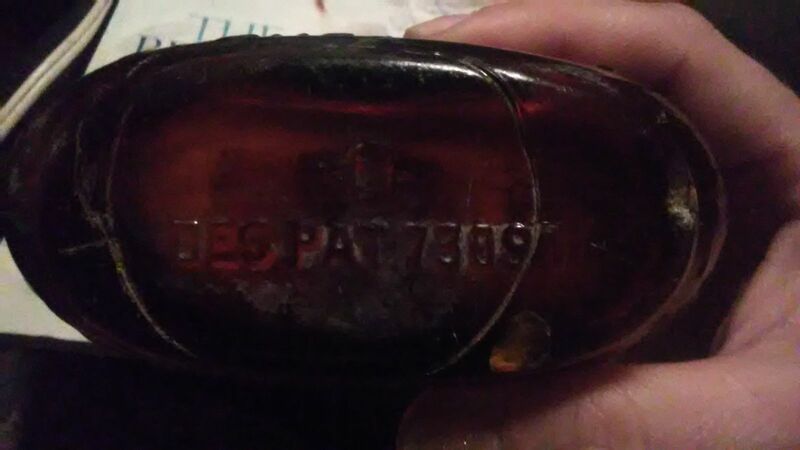 It says on bottom "DES PAT 73096" as the first guy posted, and has a little symbol above that looks like an eye looking through a circle, but the eye extends beyond each side of the small circle or zero or 'O". Could this be an "O" for Owen? Or did they use O? This maybe some sort of design and not an Option OR a zero. Not sure. 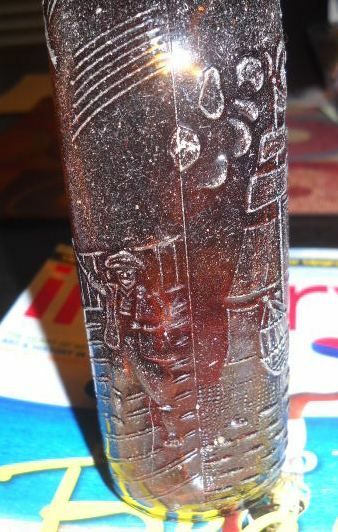 The same scene is "embrossed"(I THINK that is the correct term) raised art on the bottle...as on the first posted bottle above: ship up one side of the bottle floating in on water that spreads across the bottom of the bottle on same side as "FEDERAL LAW FORBIDS RESALE OR REUSE OF THIS BOTTLE", revolutionary scene, looks like 18th century soldier with sword, dead men on ground, ship with flag and the water is behind him; another ship on other side up the side of the bottle as well. 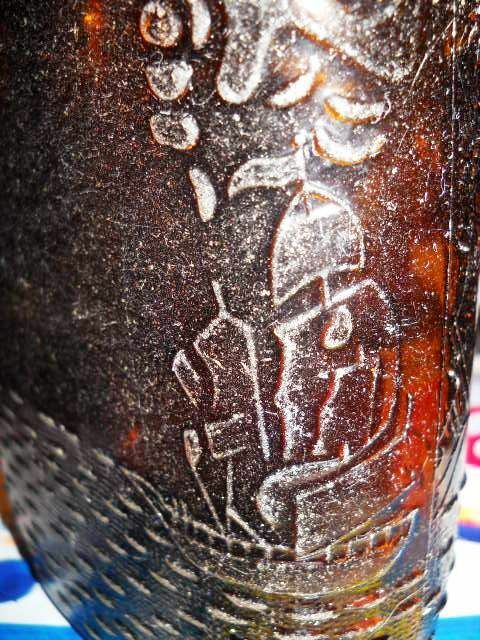 Head of what looks like that same soldier imprinted larger above "ONE PINT." I am assuming this person is of some importance in our history. There are spaces on each side where labels are missing. Seam APPEARS to go all the way to the lip, which has a screw on lid. If the seam reaches the lip, it means it was not BIM or BIMAL, correct? There are so many exceptions mixed in amidst the different time periods that I am a bit confused. 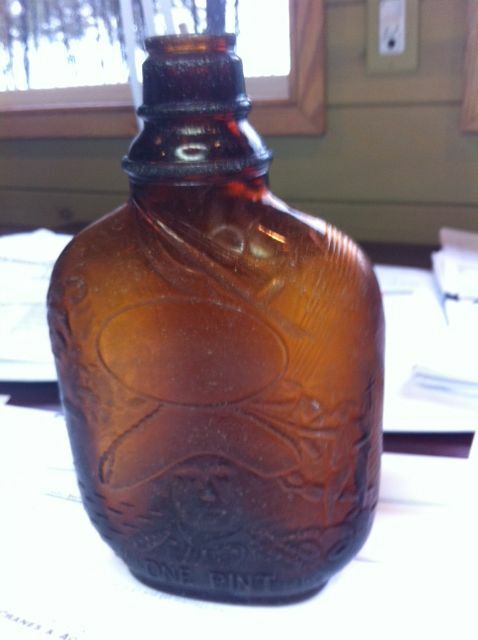 By 1913, most bottles were made by ABM (Automatic Bottle Machines), as I learned by reading last night. Please correct me if I am wrong. 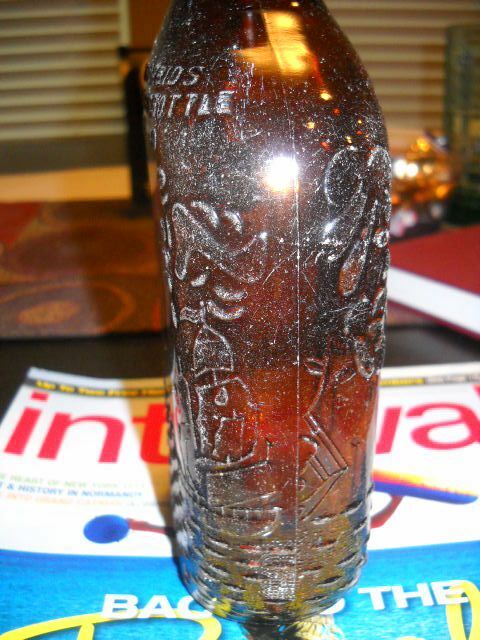 This bottle I have would have to have been made between 1932-1964 considering the prohibition according to research. Yet the scene seems to depict 1700-1800s, I am guessing a representation of the English and taxes on liquor? I am confused. If anyone else ever found the value, please let me know. I have learned alot but am light-years from becoming an expert. Will post pictures if possible.Thank you.